There was a time when digital photography did not exist and film was the standard medium of photography. 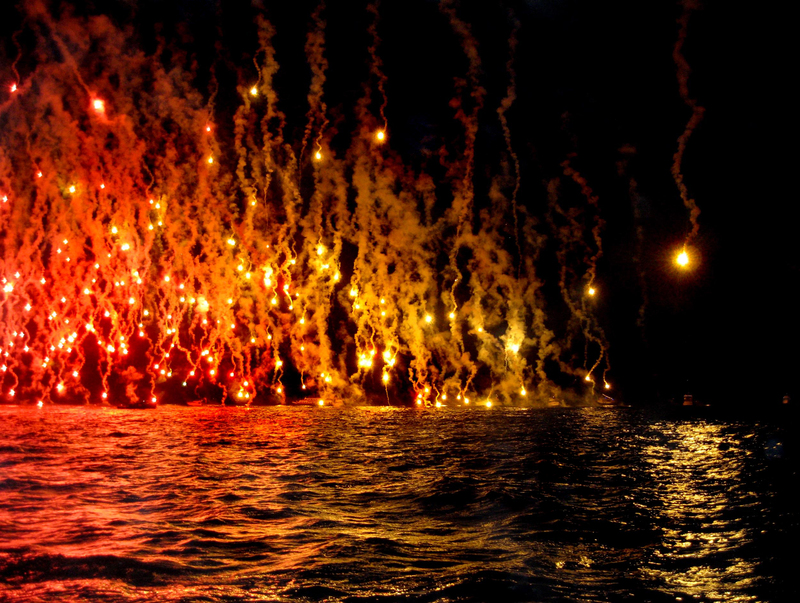 All pictures were developed and printed in darkrooms, under red lights and surrounded by the smell of chemicals. With the advent of digital photography, films and darkrooms are becoming obsolete but the techniques used to improve images still live on in post processing computer software such as Adobe Photoshop, Gimp and Paintshop Pro. I will be using Adobe Photoshop CS2 as my photo editing program although other programs will have similar tools. Let us look more closely at three post processing tools that can drastically improve your images, namely the measure tool, the spot healing tool and the clone stamp tool. Have you ever taken shots where the image is askew? The horizon looks tilted and the subject in your shot looks like it’s about to slide to one side of the frame. The measure tool is a very simple way to straighten your shots. It can be located at the tools banner at the left side of the screen. You might see the eyedropper tool first but right click on it and the measure tool should appear. Using your cursor, draw a line from one end of the horizon to the other. When you’re done, click on Image>Rotate Canvas>Arbitrary… A little window will appear showing the angle of the ruler, the acronyms CW (clockwise) and CCW (counterclockwise). The software will automatically choose on which side the picture should be rotated to straighten the shot by bringing the angle down to 0. You don’t have to change anything in this window, just press the OK button and voila! Your horizon is now straight. You can also use the measure tool to align your subject vertically, such as straightening crooked buildings or lampposts. Once you get the hang of this tool, straightening your image will take only a few seconds. Spot healing, as the name suggests, is great for cleaning up little areas in the image such as sensor dust, grains of dirt, and it is the perfect solution to removing facial blemishes. It makes these small imperfections vanish by matching information from the surrounding pixels such as texture, lighting, and shading, and then blending them to seamlessly cover the specific area where you click the spot healing brush. 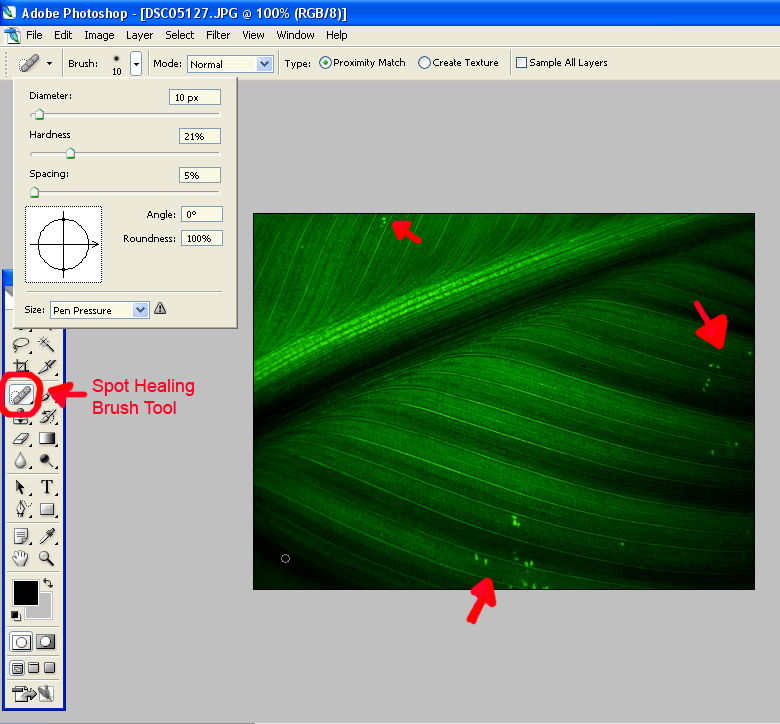 You do not need to specify a sample spot for an area to be healed, unlike with the Healing Brush tool. In this screenshot, you can see the problem spots on the leaf image. There are several small dots on the leaf (by the red arrows) that are lighter in shade which seem to make the image look unclean. The Spot Healing Brush tool is perfect in quickly removing these blemishes. When you click on this particular tool, the toolbar at the top will change to the brush preferences. Click on the arrow button beside the word ‘Brush’ for a dropdown window to appear. Choose a brush diameter that is slightly bigger than the spot you want to heal. Using the hardness scale, you can choose how strong and solid you want your brush tip to be. For simple retouching, set your Brush mode to ‘Normal’ and choose between two types of healing options, the Proximity Match and the Create Texture. Proximity Match is used in most cases. It samples the nearby pixels at the selection’s edge to correct the blemish while Create Texture makes use of all the pixels inside the selection to create a texture to cover the flaw. You can also click on the ‘Sample All Layers’ option which creates a new layer for which to use your spot healing brush. This gives you the results at the top layer while the image in the original layer remains untouched. The great advantage of this is that if you made a mistake and want to redo your spot editing, then you can just delete the top layer while the rest of the work you did at the lower layers or the original image will not be affected. This is a ‘before and after’ example of what the Spot Healing Brush tool can do. Without the distracting little dots sprinkled around the leaf image, it now looks smooth and clean. 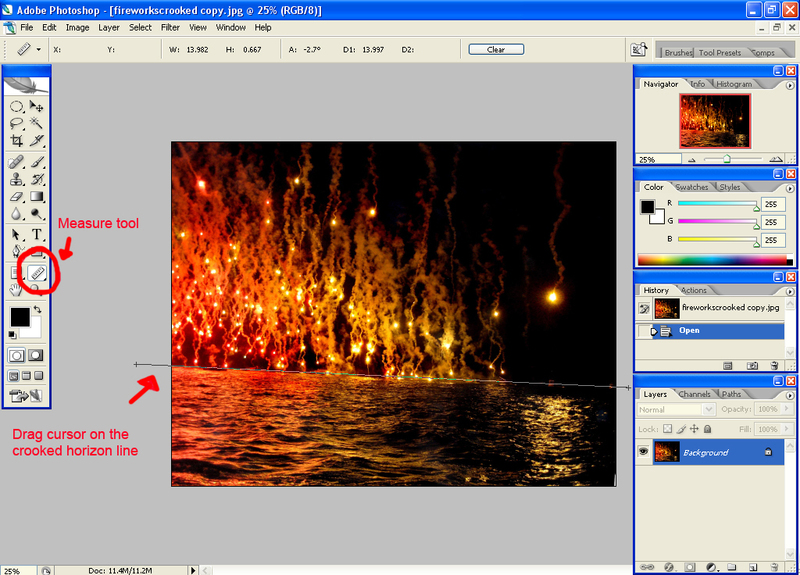 There are two main reasons the Clone Stamp tool is most often used. One is for copying a detail to another location in the image and the other is to remove objects. After selecting the Clone Stamp tool found on the left toolbar, press on the Alt button on the keyboard then click on the image area which you want to copy. After that, click on the spot where you want the selected area to emerge and, while holding down the left mouse button, drag your cursor back and forth until the sample area appears. To give you an exaggerated example as to how the Clone Stamp tool works, here is an image of the moon. It’s a pretty moon but what if I wanted two moons in one sky? 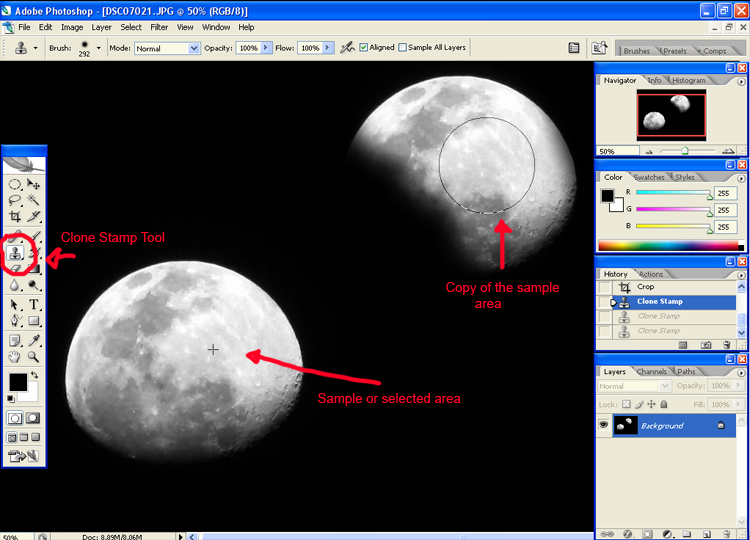 By using this tool, I can copy the moon to add another in the same shot. What if, instead of adding, you want to remove something? In this macro shot of a paper tear, I used the clone stamp tool to remove the diagonal line at the center of the frame. I cloned over the line by selecting the nearby empty parts of the paper as my sample area. Play around with your brush size since if it’s too big, it will clone a bigger area that you might not want to include. Also, don’t forget to first make a copy layer of your original image. This way, you can protect it while you are doing your retouching. In case you make a mistake, you can just delete the clone stamp layer without harming the original image. These three photo editing tools are quick to use, can easily improve your shots in a few minutes and are necessary components of your photo editing skills. As you practice your digital darkroom techniques you will soon find these tools invaluable. This entry was posted on Friday, September 3rd, 2010 at 6:16 am	and is filed under Articles, Photography Tutorials, Photoshop Tutorials. You can follow any responses to this entry through the RSS 2.0 feed. You can leave a response, or trackback from your own site.